How an Auction Chant Works | Lawson & Co. When you go to an auction, it often sounds like the auction chant is its own sort of song. There’s a special rhythm to the speech that helps move the sales along, and since these events can’t last forever, it’s important that the auctioneer keep the bids moving. But do you know how the chant started? And do you know how it works? The history of the auctioneer extends as far back as the Roman Empire. It was common method to buy and sell various goods by increasing bids. The rhythmic chant used at livestock auctions though, is somewhat unique. It developed as a way to sell animals faster and to keep the process moving at a steady, rolling pace. Auctions might only last a few hours, but they sure sell a lot of stock! Today, we see auctions for all types of sales. You can sell a house, farm, or commercial real estate by auction. You can also use the auction method to liquidate personal property such as your furniture, cars, antiques, or other collectible items, like coins, stamps, and art. The possibilities are endless! When you first hear the auctioneer chant, it can be difficult to understand what’s actually going on. But rest assured, there’s more happening than just a lot of fast talking. Perfecting that auctioneer chant can take many years, and it’s carefully stylized to get the best results for everyone at the auction. The auctioneer chant is designed with two parts in mind: the statement (the current bid) and the question (the next bid). So, an auctioneer might say, “I have 10 dollars. Would you bid 15?” First, they state the fact, then they prompt bidders to raise their offers. Of course, we also hear “filler words” in auctioneer chants. These phrases help give the bidders time to think through their next move. 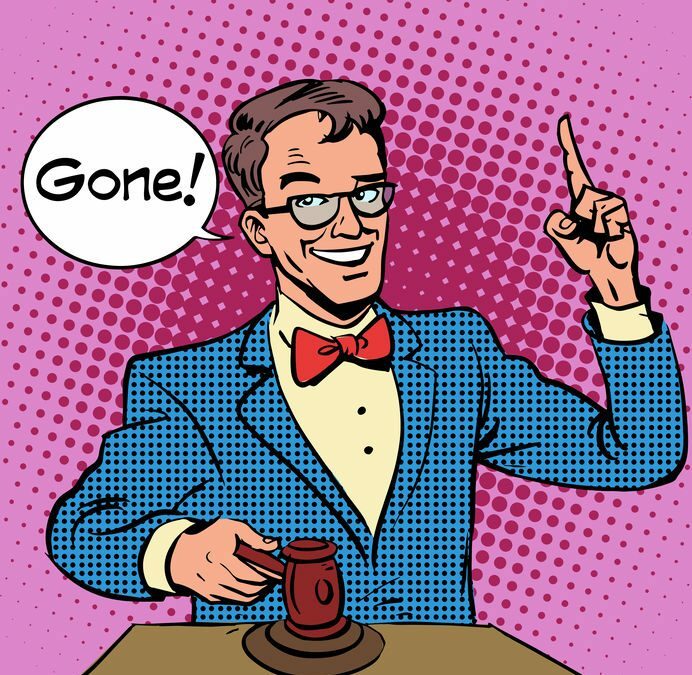 These phrases can vary from auctioneer to auctioneer, but the general purpose is the same. It’s just a way to link more statement-questions together and keep the conversation moving. When done well, the auctioneer chant works to keep the crowd to listen longer and keep the bids moving with a steady flow and roll. If you’ve never been to an auction, it’s quite the experience! Ready to Schedule Your Auction? The auction method can be a great way to maximize your selling price for a variety of different items—from antiques to real estate. It also gives buyers a unique model and access to one-of-a-kind sales in a fun and exciting way. Since most business is done on the sale date, you can move forward with your purchase right away. As real estate and personal property auctioneers, LAWSON & CO. is proud to work with a variety of individuals on their auctions and appraisals. Let our team help you liquidate your assets! Send us a message to learn more about our process. We’d be happy to help with your upcoming auction.